Biz Tips: Are Your Customers Suffering From Satisfaction Survey Fatigue? Survey data is only helpful when it is accurate. Unless a customer service interaction is truly memorable–good or bad–chances are the customer will forget details over time. This makes the timing of surveying critical. For this reason, consider surveying customers within a few hours or up to a day after the interaction. Customers will have the best and most accurate recollection of the service received. Wait much longer and the risk of them not remembering details increases. They may still remember broad impressions, but the opportunity for meaningful feedback will dwindle as time passes. Surveys are always designed with the best intentions to expose all the shortfalls experienced by customers. Unfortunately, that good intent typically results in a long list of questions covering a wide range of topics. Value your customers’ time. The fact that they had a problem in the first place and had to contact customer services means they already took precious time out of their day to get things back on track. Focus questions on the most important topics or issues needing input or measurement. Consider the consequences of a long survey. Any survey that will take beyond a minute or two increases poor responses and abandonment rates. This can be somewhat mitigated by informing customers upfront approximately how long the survey will take. In the end, it’s more beneficial to get a larger pool of responses on the areas of concern than to get incomplete responses from only a few customers. Going hand-in-hand with keeping surveys short is simplicity. Questions must be straightforward and easy to understand. Providing easily selectable choices instead of long-form answers helps with limiting the time required to complete the survey. It also delivers consistent, measurable responses across customers. This doesn’t mean free-form comment boxes to supplement responses shouldn’t be used, just keep them optional. When using a rating scale, less is more. Presenting customers with a 10-point rating scale can make it challenging for customers to choose. Provide ratings definitions upfront so it’s easy for customers to clearly communicate if service was poor or great. Consider NOT providing a neutral or “middle of the road” option. Removing a neutral option forces the customer to rate the service being on one side of the spectrum or the other. We’ve established customers are busy and didn’t anticipate a problem requiring them to contact customer service. They really aren’t interested also in taking time to provide feedback … unless there’s something in it for them. Consider offering an incentive. That incentive can take many forms: a $5 gift card to a national coffee chain or an entry into a monthly sweepstakes for a more valuable prize. While some additional cost and administration will be necessary, this investment could make the difference between few and many responses. Surveys can be tied to a customer’s interaction or performed anonymously. Offer an anonymous feedback option if customers have raised privacy concerns or if it’s felt customers might be reluctant to provide feedback if they believe criticism might affect future transactions. This eliminates a possible barrier to their participation. Ideally, the customer is known. This makes it possible to relate the customer’s responses back to their specific journey, including information such as case details, the agent(s) they worked with, self-service channel(s) used, etc. that can help shed light on their responses. Connecting the survey responses to the customer has additional benefits. Businesses seek to improve the customer experience because it assists in customer loyalty, making it possible to sell more products and services to them. Surveying enables the tracking and measurement of individual customers’ sentiment over time. Sharing that opinion with customer service agents provides actionable insights, such as being even more accommodating if the last interaction wasn’t positive. On this topic, it comes down to what’s most important for the business: collecting a greater amount of anonymous customer service feedback or more specific responses making it possible to address distinct service instances and to track individual customer sentiment. Improving the customer experience isn’t an option in today’s competitive world. Minimizing effort is key and companies must be on the lookout for opportunities to improve, especially when customers have required service. Surveying is a great method of validating the service experience with the customer. 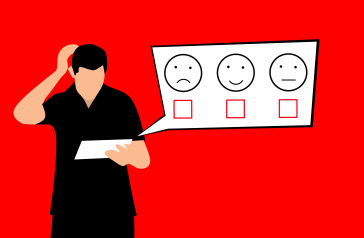 Done right–with a short, easy to understand set of questions, in a timely manner, with an incentive attached–surveys can provide insights critical to smoothing out any bumps in the customer’s service journey. Biz Tips: Are Point-of-Sale Surveys Pointless?